Mafatlal Industries Ltd is in portfolio of Bharat Jayantilal. He is one of the top investors in India. The company belongs to Textiles sector. As per the Company website it wide range of fabric products like Shirtings, Suitings, Denims, Corduroys, School, Corporate & Institutional Uniforms, Bed &Bath Linen and Ready-mades. The Company factories are located in state of Gujarat (Nadiad and Navsari). The head office is situated in Mumbai. It has online as well as offline presence. It has PAN India offline retail shop presence. Most of the states have Family Shops catering products from this Company. The stock has fluctuating history. The movement can be clubbed as cyclic with sharp rise and slow decline mark the long term story of the Company. It is not consistent growth story which investors would like to invest in. 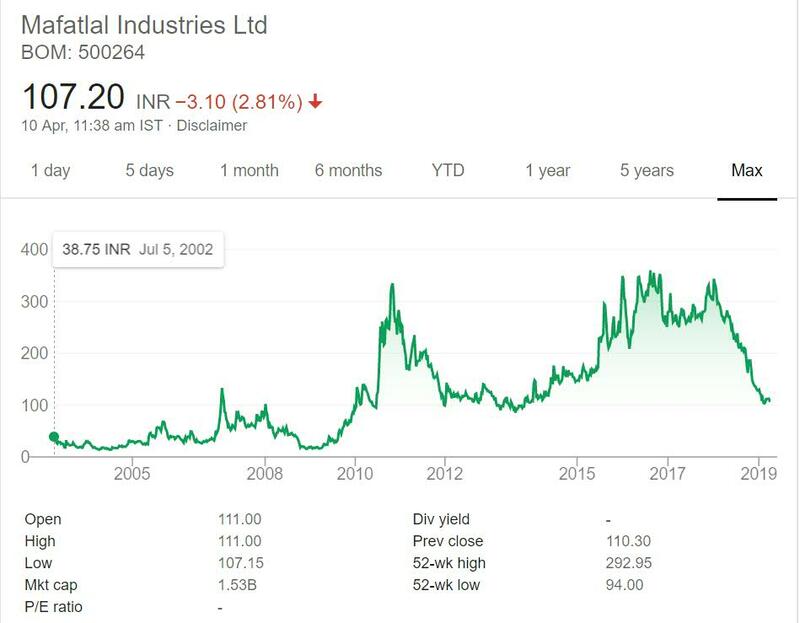 The Company traded near 39 INR mark in year 2002. Till year 2009 it had one jump past 100 and then traded below the 2002 levels due to global crisis. But this pattern continued in year 2010 to 2013 and then 2015 to 2018. The stock has sharp falls after rise. So if you are planning to invest in this stock then never invest at higher levels. Mafatlal Industries Ltd is a Textiles Company.The Company has wide presence in India and has tie up with international players like Spencer. It has products for all age groups and gender. So the Company is complete one stop family shop for buyers. The retail shops are present in most of the states. It also has online presence to tap on new wave of customers. But the performance of Company is cyclic as per the long term chart given above. The textile space is competitive but is evergreen sector. With economic boost and rising population this sector is bound to do good. But for next wave of future growth Company should start focusing on International market along with domestic market as well. Personally I have not invested in this sector as it is very competitive sector and it is tough to predict customer mindset. New companies are emerging with time to tap on the market. There are few dominant players as well. So sector becomes very competitive. Despite these facts most of the top investors have one or more stock from this sector in their portfolio.